I’ve long been meaning to post about some fabulous and intriguing books I’ve read recently. 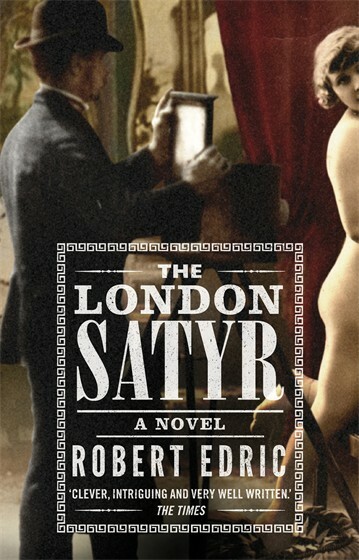 First in line is Robert Edric’s The London Satyr. 1891. London is simmering in the oppressive summer heat, the air thick with sexual repression. But a wave of morality is about to rock the capital as the puritans of the London Vigilance Committee seek out perversion and aberrant behaviour in all its forms. Charles Webster, an impoverished photographer working at the Lyceum Theatre, has been sucked into a shadowy demi-monde which exists beneath the surface of civilized society. It is a world of pornographers and prostitutes, orchestrated by master manipulator Marlow, for whom Webster illicitly provides theatrical costumes for pornographic shoots. After reading his PS Publishing novella, The Mermaids, in 2012 I had the pleasure of interviewing Robert Edric. (Part 1 of the inteview is posted here. I intend to transcribe the rest of it as time allows.) The London Satyr was very different but no less pleasing to read than The Mermaids. The plot layers within The London Satyr allowed me to get lost in the corners of its streets and backstage world, but this novel can’t and won’t be boiled down to that. Edric’s prose–his sentences–are little gifts in themselves. As Webster walks through this perilous situation, I felt I was walking with him through London, always considering things, interpreting glances and shadows, always on guard, falling into more and more danger alongside him. Thrilling, to say the least. “When Caroline had been alive, she had often waited for me at the corner of the street, a few doors from our own, looking out for me as I climbed the gentle slope. And upon seeing me, seeing me wave to her and then crouch down and hold out my arms to her, she would run towards me at a gaterhing pace, stopped only by her collision into me, whereupon, having steadied myself, I would rise and lift her into the air and spin her, holding her against my chest and over my shoulder until all of her sudden energy and momentum was lost, absorbed into my body and then passing in a tremor through me into the solid ground beneath us. I would feel this happen, feel her small and fragile body and all its vital forces absorbed into my own. There were days when I had set off home already looking forward to this meeting, always disappointed when something kept her from the corner. She would hang laughing uncontrollably over my shoulder and then babble her day’s news into my ear. News of the things she had done, the people she had seen, what she had eaten, what she had worn, what her mother had said to her, what her sister had said, what she had said to them. A whole day in those few spinning seconds. And later, these stories would resume at bedtime, when I would sit with her as she fell asleep. Sometimes, I would go on spinning these tales long after her eyes had closed, lowering my voice to a whisper for the simple pleasure of sitting with my child and watching her sleep, secure in the knowledge that she was happy and well and safe, and secure too in my own fierce conviction of the endless future and what it held for us both. It’s when I read passages like this that I know something in my bones: reading makes us more human. This entry was posted in Uncategorized and tagged books, fiction, Robert Edric, sentences, The London Satyr. Bookmark the permalink.